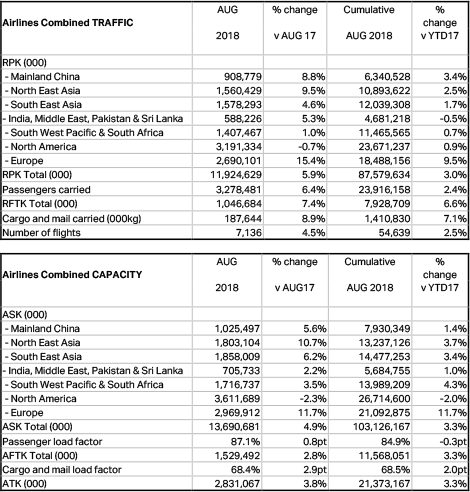 Cathay Pacific Group today released combined Cathay Pacific and Cathay Dragon traffic figures for August 2018 that show an increase in both the number of passengers carried and cargo and mail uplifted compared to the same month in 2017. Cathay Pacific Director Commercial and Cargo Ronald Lam said: "Traffic volume in August outgrew capacity increases, with the recent strong demand for our premium cabins continuing throughout the month. We also witnessed yield growth in the backend thanks in part to a better traffic mix. "Our cargo business also continued its good momentum in August. Tonnage grew ahead of capacity, which was driven by strong transshipment volumes across our network. We saw good growth among the pharmaceutical and perishable segments. "However, the favourable currency trend that we have enjoyed so far this year is reversing rapidly. Besides, our performance in September is set to be negatively impacted by the significant typhoons that disrupted our operations in both Japan and Hong Kong, especially our cargo business which is in its seasonal peak. We are also closely monitoring external factors that have the potential to impact global trade."